Information below is for 1.7 Version. 1.7.10 is no longer supported! 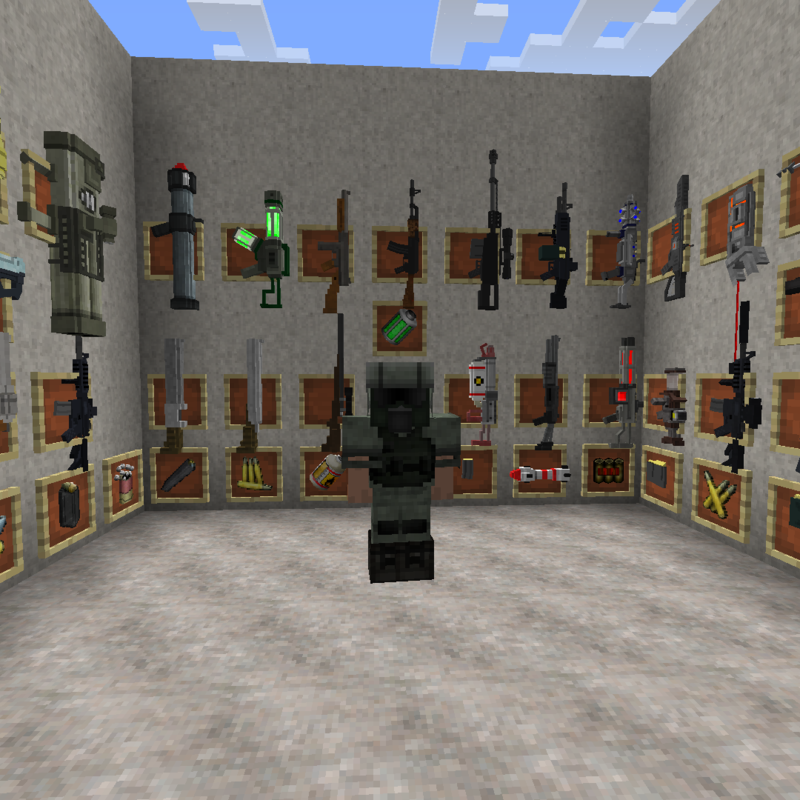 Techguns is a survival based tech mod that adds guns, armors and many more things. Techguns is in beta now. It should work on a dedicated server, I can't guarantee that it does nothing bad, but It was tested on a dedicated server for a few days and did not cause problems. You can enable copper and lead, steel smelting etc, if you don't have other mods that add it. New option: machines need no power, if this is set to true machines behave as they are at full RF all the time. Gore is enabled by default!!! If you don't want gore disable it in config file!, this is clientside, and independent from a dedicated server. Techguns spawns some structures in the world, if you don't want them disable them in the config file (config/Techguns.cfg): 'B:SpawnStructures=true' in section general. Note: don't attack military bases without decent armour. To make NPC's stop spawning in military bases you must destroy the flag. It just could happen that they don't like that and send out something after you ;-). Techguns uses now a danger system, that means more dangerous npcs may spawn further away from the worldspawn. Hot and cold biomes are also more dangerous. Don't start in a desert. If you don't like some NPCs you can change the spawn weights in the config file. Dependencies not correctly installed, either cofhlib or chisel missing (or wrong chisel, there are more than 1 version), Java 1.6 also causes crashes, outdated forge builds might cause problems too. Requirements are listed below. FTB Utilities (https://minecraft.curseforge.com/projects/ftb-utilities) - When playing on a server where not everybody is allied, turrets can use the friends system and attack unfriendly players, otherwise not needed. Tinker's Construct (http://mods.curse.com/mc-mods/minecraft/tinkers-construct) - Integration into InventoryTabs, Some materials of Techguns are added to TC. Not enough keys (http://minecraft.curseforge.com/projects/notenoughkeys) - causes problems with gun shooting/animation. Not gamebreaking/crashing but quite annoying. New inventory tab, compatible with Tinker's Construct. If TC is installed it will integrate into it's tab registry. Face slot: wear things like a Gas Mask. Back slot: Glider and jetpack. New slots to put ammo. Auto food slots: automatically eat food put in here. Different damage types and armor values against each type. New hostile NPCs that use guns too. Turrets that can use guns. Brutal animations like gore or dissolving. DISABLED in config by default! Must be enabled in config, not going to explain how you do that. No gore for kiddies, sry. Can switch skins of some Techguns armors and Weapons. Only a few have multiple skins currently. Repair Techguns armors here. Costs less than anvil and no XP. Armors can't be destroyed but become useless when at 0 durability. Multiblock machines that generate ores out of clusters (Ore clusters spawn in the world, see section about configuration for making them spawn). Ore clusters last forever but drills are not free and require power. The amount of ores/time that can be get out of a cluster is limited. Effectiveness is configurable. Configure ore drill power and ore rates. Default rates (1.0) are for dedicated servers with chunkloaders, for singleplayer you should set the ore rate a lot higher and power lower. where do i find copper? It should spawn in your world if you haven't turned it of in your config. (it is on by default). If you have added techguns to an existing worlds you need to look in newly generated chunks. Depends on when forge releases a stable version and how the situation with 1.14 is. Currently I think there is a high chance 1.13 will be skipped. could you maybe make a version of techguns that has only nerf guns in it? how do i make it so that even ops are forced to safemod? i have a question why can't i craft a golden revolver even though i even used the not enough items auto craft, i did craft another one so maybe that's the reason? mekanism also works with techguns? are anymore weapons gonna be added? How can i get super mutants to spawn? I can only get 3 buildings to spawn per world and they are just small buildings do i need any other mods for worldgen?